Terrorists made every effort to derail Iraq’s parliamentary elections on Sunday, but Iraqis were undeterred as they made their way to cast their ballot and decide the political fate of more than 6,000 candidates competing for just 325 parliamentary seats. As I made my way in the morning to the various polling stations around Baghdad, I was greeted by the sounds of more than 15 mortar attacks and a barage of attacks were launched throughout the day. 38 people were killed nationwide but it was a weak, albeit persistent, attempt to discourage Iraqis from voting. Estimates suggest 60% of the 19 million eligible voters took to the polling stations. 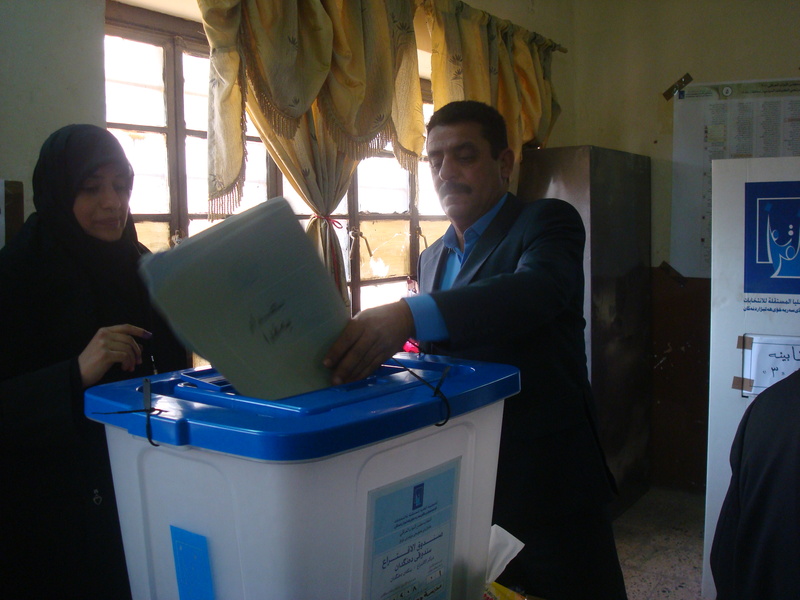 There was a great desire among Iraqis to vote; those I spoke to – from your average voter to electoral officials and political observers from various parties – were keen to exercise their vote, knew who they were voting for and seemed to be well informed and educated about the whole democratic process. They understood, appreciated and enjoyed the fact that their vote can punish parties and individuals who have failed to perform, thanks all to the open-list system that was adopted this time round. In some instances the environment was even festive, music blaring in the backgrounds and voters cheerfully waving their purple ink-covered index finger in the air. Contrary to some of the reporting out there, the problem for the voters was not security at all but instead procedural incompetence; Iraqis would turn up to their polling station to find that their names were not on the voter registration lists. They would be turned away to go to a special polling station to check for their names there, and in some cases these were nearby. As a result you would find a minor but loud argument taking place between official and the keen voter. Further, a huge number of security personnel names were not given to the Iraqi High Electoral Commission in the months before the elections; more than 200,000 names had been provided just two days before, resulting in confusion and, therefore, many being unable to vote. The other problem that prevented Iraqis from voting was the curfew and major security operation that stopped them from driving to the polls or catching local buses, many lived far away and the government-run shuttle service was inefficient and is generally poor. Tensions were apparent to me in Kirkuk on the day of the voting process for members of the security forces, which took place on Thursday with varying degrees of intimidation and attempts to manipulate the vote, but hardly suprising given the explosive state of affairs in the area. Sunday proved to be a victory for Iraqi democracy. There are tough times ahead with the next phase revolving around coalition building and the issue of who becomes prime minister, something that may turn out to be as controversial and tumultous as events before the elections and which could drag on for at least three months. Security is also still a matter; the elections required around 1 million security personnel, meaning it is not yet the sort of democracy that exists in the West. Yet, there are few in the West who enjoy the comfort of security and stability, probably none, who would be willing to go out, exercise their vote and embrace democracy in the same way Iraqis did on Sunday in what was less than normal and comfortable circumstances.